How do you energize a commodity situation...take it to a breakthrough? Turns out that prior experience has a lot to do with it. This morning I was talking with a client who has an incredible track record for creating new opportunities for common commodity products. He and I share an almost mystical belief that eventually customers will ask for anything. Remember when cell phones were free? Who would have thought the most popular phone in history would cost $400...competing against those free phones? Commodity occurs when top suppliers supply indistinguishable products. Breaking a commodity logjam can hinge on easier, faster, cheaper, better in some way that is defined by the customer. The trick is to make it available, and then get clients to focus on why they want it. The history of fashion, technology, transportation, and other industries all show a continuous curve of commodity breakthrough development. 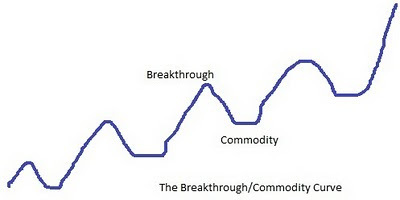 Where have you used the commodity/breakthrough curve? It seems to me that recognizing this "curve" supports the importance of creative thinking as you develop a product or service. Sometimes starting at the beginning and thinking about what you would like to see is better than trying to improve something that already exists. There is also the blue ocean/red ocean model, of which Cirque du Soleil is the prime example. Living in the commodity circus world, they invented the combined circus/theatre model to create a market where none existed before and in which no one else could compete. Where do a company's unique talents allow it to invent a new industry, as with the cell phone cited?